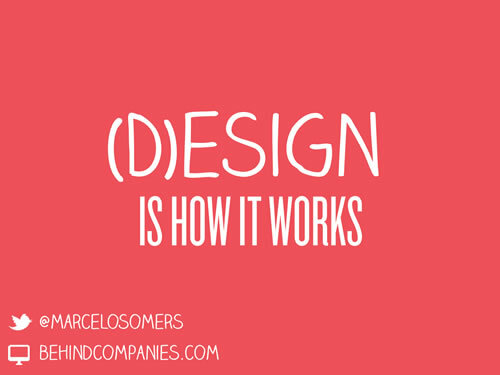 This deck by Marcelo Somers was a really good way to start my creative morning. – great reminders to the fact that it isn’t all just about pretty pictures and pixels, our goal with design should be to solve problems first. Good stuff, definitely worth taking 10 minutes to dig through. From the Big (D)esign conference in 2011. Thanks, Marcelo! « I Can Do That With My Phone? The typography is beautifull. Is there any website where i can download this one? Believing that you had created by (D)ESIGN!! !